I’m a big advocate of milestone archives (surprisingly, its less common than you’d think). Making a significant revision mid-way between milestone deliverables? Archive. Getting ready to clean up the model by ‘accepting’ Design Options? Archive. This leads to me being an even BIGGER advocate for adding clarification notes when Syncing to Central. Note that the setting options include releasing (or not) both borrowed elements and owned worksets. The Comment field allows the user to enter in a summary of the key actions/revisions just done. These comments become part of a log of the Central file. The aspect of this that is MOST VALUABLE to Project Managers, and really anyone who needs to keep tabs on status of the BIM, is that this log can be accessed WITHOUT opening the model. For a PM, who may need to check in on several projects, this can be a HUGE timesaver. No need to wait agonizing minutes for a large model to open, then have to root around between sheets/views to get a sense of where things are at. Pulling up the comments list is done through the Revit interface, but does NOT require opening the (or any) model. Go to the Collaborate tab, and select the Show History tool. (NOTE, it is one of the few tools available when no model is current open). 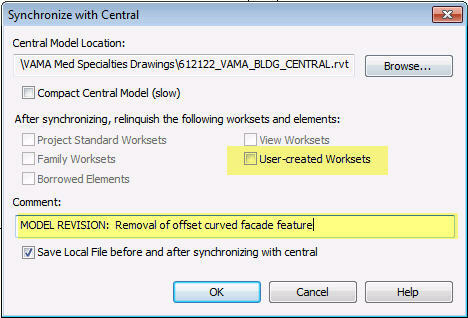 This entry was posted in BIM/Revit and tagged BestPractice, DocumentationWorkflow, ProjectManagement, Revit. Bookmark the permalink.